For the past several years, Trumpeter Swans hatched at the Topeka Zoo and Conservation Center have been released back to the wild to bolster the wild population. 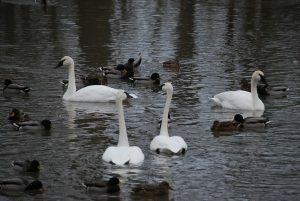 This morning, two wild Trumpeter Swans dropped in for a visit with the pair of Trumpeters that call the Topeka Zoo home. In the early 1900’s, Trumpeter Swans nearly became extinct. With laws in place to protect them and active breed and release programs, the species has made a dramatic turnaround and the population today is estimated to be in excess of 35,000 birds. Trumpeter Swans range from Alaska and Western Canada down into the Northern United States. Kansas is typically not considered to be part of their normal range. The weather front that passed through this past weekend most likely pushed them further South.